Eye care goes beyond eyesight. A comprehensive eye examination at Modern Eyes Optometry includes checking eyesight, binocular vision, ocular health and related systemic health concerns. Upon arrival, you will be asked to verify your contact information, your medical history and any vision and ocular concerns you may be experiencing. External and internal eye health assessment to determine if diseases such as dry eye, glaucoma, cataracts, macular degeneration and diabetes are present. Only your optometrist can determine exactly how often you should have your eyes examined. The frequency of visits is usually based on age; however, specific eye conditions may dictate more frequent partial or full examinations. Urgent eye issues like sudden vision changes, infections, inflammation and eye injuries (including foreign bodies in the eye) may warrant an immediate appointment with your optometrist. If you experience any of these symptoms, contact Modern Eyes Optometry; if required, we will see you same-day. Children should undergo their first eye examination at six months of age and annually thereafter. Visual abilities play a key role in early development; early detection and treatment of eye conditions can significantly decrease lifelong vision impairment. 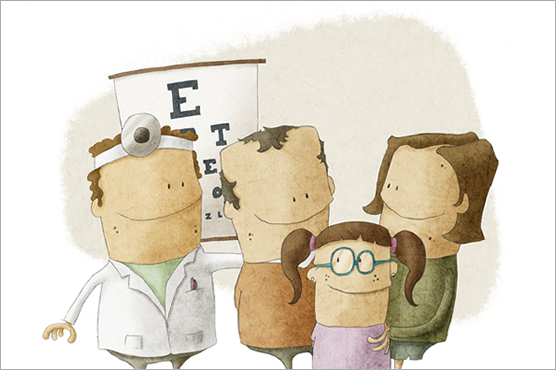 Eye examinations for children and young adults 19 years of age and under are covered by OHIP. Adults 20 to 64 years of age are recommended to undergo a comprehensive eye examination on a one-to-two-year basis. Seniors 65+ years of age are recommended to see an optometrist annually. Many eye diseases do not present in the early stages but can later result in permanent vision loss. We use advanced ocular imaging and diagnostic technology to look for any functional or structural indications of serious eye diseases such as dry eye disease, glaucoma, age-related macular degeneration, diabetic eye disease and many more. We care about educating our patients and the general public about the importance of regular eye exams. During your visit at Modern Eyes Optometry, our team takes time to explain diagnostic tests, results of your examination, treatment plans and eyewear solutions. We are also happy to answer any questions you may have. At Modern Eyes Optometry, we understand that one type of eyewear may not be suitable for all your daily activities. That is why we offer a wide variety of corrective solutions, including an excellent selection of eyeglass frames, lenses, contact lenses, sunglasses, safety glasses and sports goggles. Read more about all our corrective solutions and eyewear options.